In an all-too-familiar scenario, two factions among the members of a congregation affiliated with the Evangelical Lutheran Church in America (ELCA) have locked horns. The issues are complex and the story is still being written, but one thing is certain. Grace Lutheran Church in Eau Claire, Wisconsin, will never be the same. And members and former members may not be speaking to one another for years to come. Grace, an historic congregation located near the center of this mid-sized northwest Wisconsin city, has been experiencing slow decline in recent years. Once a community of several thousand members, the parish had become a fraction of its former size. Grace has been something of a flagship congregation for decades. Statistics filed by the congregation’s leadership with the ELCA for nearly two decades indicate an average drop in attendance since 1990 from over 900 each weekend to only half that number in recent years. Grace is not alone. Seven of the other eight ELCA congregations in the city have seen average attendance numbers decline during the same period. Still, Grace has been something of a flagship congregation for decades, sponsoring its own radio and television broadcasts, operating the third largest food bank in its county, hosting community groups such as AA, and administering a multi-million-dollar endowment fund. There were concerns about social statements approved by the Church-wide organization. Leaders were not happy when the ELCA entered into a shared ministry agreement with the Episcopal Church, which brought with it an understanding of the role and authority of bishops that was anathema to Nestingen, who had been nurtured in the Lutheran Free Church tradition. When a 2009 vote, taken in Minneapolis, permitted clergy living in committed same-gender relationships to serve on the ELCA roster, the leadership of Grace decided it was time to begin moving toward a different affiliation. Following a familiar pattern — hundreds of ELCA congregations have now gone down this path, some departing, some remaining in the church body — the leadership of Grace asked the members to vote on severing its denominational ties. The constitutions of ELCA congregations prescribe a method for taking such action. Two properly-announced voters’ meetings must be called; two-thirds of those voting must approve such a proposal at each meeting; the synod bishop must consult with members of the congregation, advising them of their options. Grace took the first vote in early April 2011. The measure failed to achieve the needed two-thirds “super majority.” Instead, only 288 (56 percent) were in favor, with 225 (44 percent) dissenting. Two days later the church council voted to affiliate with a group that had broken with the ELCA earlier, Lutheran Congregations in Mission for Christ (LCMC). But the ELCA does not permit congregations to affiliate with two church bodies simultaneously. That is when things became complicated. Dissenting members, who favored remaining in the ELCA, regrouped at nearby First Lutheran ELCA (Grace’s mother church, as it turns out) and became a synodically-authorized worshiping community. They called themselves “Amazing Grace” congregation. At that point, even though a voters’ meeting hadn’t yet been called to take an official vote on the matter, Grace Lutheran was theoretically aligned with two church bodies. But that was far from the end of it. Then the Northwest Synod of Wisconsin weighed in. The regional ELCA jurisdiction within which Eau Claire and its congregations are included issued an ultimatum to “Grace LCMC.” It declared that anyone not wishing to break ties with the ELCA would be considered a voting member of the congregation, and anyone having supported the LCMC would be considered an “associate member without vote.” The synod also instructed “Grace LCMC” to disaffiliate with LCMC immediately. Those who thought things could not become more convoluted were mistaken. With the congregation’s annual meeting planned for late January 2012, the ELCA loyalists brought a second legal action, requesting the meeting be postponed indefinitely. They asked a judge to remove the then-serving church council members and restrain the leadership from spending and/or borrowing money. The “Grace LCMC” leadership counter-sued, asking the judge to dismiss the pro-ELCA group’s petition. But in a ruling issued on May 30, Judge Molly GaleWyrick made it clear she had no intention of doing that. Instead, she ordered both groups into a 20-day period of mediation. At that point, the “Grace LCMC” leadership decided it was time to finalize their break with the ELCA. They voted to officially join LCMC with a unanimous 316-0 vote. No members of “Grace ELCA” chose to be present. That assertion was, of course, at odds with decisions handed down by both the synod and Judge GaleWyrick. The synod council sent still another directive to the leadership of “Grace LCMC,” instructing them to “immediately cease all matters regarding church governance and take cooperative steps to transfer that leadership” to those supporting the ELCA. The LCMC leadership was also instructed to hand over the keys to the building, along with financial and membership records. The LCMC leadership decided to ignore the directive, believing they were entitled to the property, since they represented the majority of the formerly-united congregation. But the synod council did not relent. They declared the pro-LCMC council members at Grace Church no longer eligible to hold office. In addition, the synod bishop removed both pastors from the ELCA roster. By April 18 the keys to the property had still not been surrendered. On that day, the attorney representing “Grace ELCA” went back to the judge, requesting her order be enforced. She attempted to do so on April 22, without success. The following afternoon, with the threat of police intervention, if compliance was not forthcoming, the keys were finally handed over. A few days later, members of “Grace ELCA” had the locks changed. The future for both groups is uncertain. 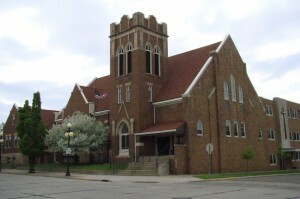 Nestingen reports there are between 300-500 worshiping in the LCMC congregation, which has renamed itself “Saving Grace Lutheran” and is currently meeting in a downtown commercial building. Nestingen says it is also unclear what the future holds for “Saving Grace” congregation, but suggests a new building may be on the horizon. A source for the ELCA group, now in possession of the church facilities and in control of the congregation’s multi-million-dollar endowment fund, told Metro Lutheran that there were about 150 members remaining, with about 100 at worship. Whether they can continue maintaining such a large worship space for the long term is an open question. Nestingen says it is also unclear what the future holds for “Saving Grace” congregation, but suggests a new building may be on the horizon. He explained that the transfer of property and assets to the ELCA group is being challenged by his leadership team, but admits the chances for securing a reversal are slim. One might wonder what happened to the rest of the members of this once-large congregation. The last time statistics for Grace Lutheran were reported to the ELCA, the baptized membership was listed as 2,755 (although some in the “loyalist” congregation say that figure was wildly inflated, and believe the membership hasn’t been that large for many years). One member of the ELCA remnant suggests an answer to what has most likely happened to the hundreds who are no longer numbered in either group: They have gone to other congregations, whether ELCA or another Lutheran church body or another denomination; or, sick of the conflict, they may simply have dropped out of church life altogether. Sources close to the leadership of “Grace LCMC” told Metro Lutheran that they are still considering future actions pertaining to Grace Lutheran Church.